Soldiers, sailors, airmen and Marines stationed at Bagram Air Base, Afghanistan remembered Americans who made the ultimate sacrifice to ensure the freedom of our nation, during a Memorial Day weekend ceremony. U.S. Army Staff Sgt. Wayne A. 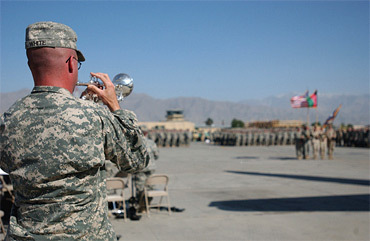 White plays taps during a Memorial Day ceremony at Bagram Air Base, Afghanistan, May 28, 2006. U.S. Army photo by Staff Sgt. Robert R. Ramon. "What does this day mean to us as we stand here at Bagram, Afghanistan, fighting in the global war on terror?" Freakley asked the hundreds of servicemembers in attendance. It is important, he said, for military members to pause and remember those who went before. "We stand on the shoulders of giants," he added. "From those who fought in the earliest days in the American military, to those who fell in Vietnam, in operations in the 90s in Panama, Grenada and Operation Desert Storm, to those who have fallen in the global war on terrorism, beginning with those members of our nation who fought right here in the opening days of Operation Enduring Freedom, as well as those who have recently fallen on our watch as CJTF 76." 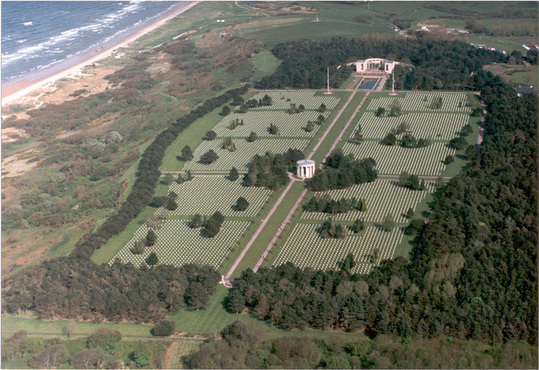 "Simply put, their lives meant sacrifice and dedication to something greater than themselves -- their nation, their fellow soldiers, sailors, airmen and Marines, and dedication to a cause -- freedom," Freakley said. "Not only freedom for the American people, but freedom for over 55 million Iraqis and Afghans who have had oppression and tyranny lifted from their shoulders and given the opportunity to form their nations to stand tall and live life in freedom and peace," he added. Freakley said it is because of those who made the ultimate sacrifice that Americans back home are able to live tranquil lives. "Those who have died have also guaranteed our own freedoms in the United States of America," he said. "Thankfully, since September the 11th, 2001, America has not been attacked. Some people could say, 'Well, we're just lucky.' I don't believe in that. "I believe that we have taken the fight to the enemy worldwide, focused in Iraq and Afghanistan, and have prevented the enemy from returning to our shores, thereby ensuring our businessmen and women can go to work in buildings without fear that an airplane will crash into it; our children can go to school and not be concerned about being killed; our citizens can go to baseball games, cookouts, and picnics and have fun this Memorial Day weekend because it has been delivered to them by those who fell and those who stand in the ranks today." "Today we dedicate ourselves, as we did before we deployed, to continuing the fight in the global war on terror and guaranteeing the American people freedom as well as the people in Afghanistan and Iraq," he said. 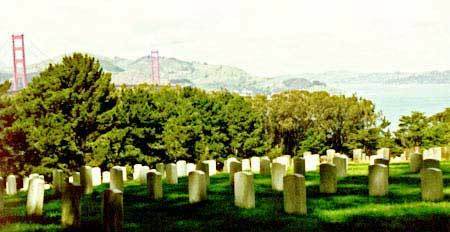 "Remember those who gave their all to our nation. They did not die in vain, for they have given us a better world, a better Afghanistan, a better Iraq, a better United States of America." Please take the time today to remember all those that sacrificed so that we are able to live in freedom. Or do as Ralph Kinney Bennett suggests in his phenomenal "Go and find a soldier's grave." Go and find a soldier's grave and think about what it means; what it really means to give your life, in its prime, for your country. Make this Memorial Day truly memorable. The RNC has prepared this video honoring the patriots who defended and currently defend America. The video runs three minutes and I found it well worth the time. According to the Associated Press, after five years a "National Moment of Remembrance" hasn't caught on. How could there be such a general lack of interest in adding a moment of remembrance, a 30-second pause, to think about the people who sacrificed to make this a great country." The Congress, by Public Law 106-579, has also designated the minute beginning at 3:00 p.m. local time on that day as a time for all Americans to observe the National Moment of Remembrance. Surely we can all take at least a moment on Monday to pause, sigh, say a prayer and contemplate those that have defended our way of life. I join President Bush in asking "all Americans to observe the National Moment of Remembrance beginning at 3 p.m., local time, on Memorial Day."